ANY EVENT is a full-service corporate event planning company, providing corporate event planning services since 1994. We believe in a client-centered approach; our focus is to assure that every event is a success for the company and for the people who hire us. To start a project, we learn about our client's strategic goals as well as define the event's audience, which may include employees, clients and/or media. From that discovery, we execute a memorable event that is carried out to the smallest detail. Our option-based proposals give clients the opportunity to evaluate a wide range of services at various levels to fit their budget. We are prepared to adjust budget selections when the budget is not set-in-stone and provide the flexibility to provide options and alternatives when requested. Sometimes our clients want to take the lead. 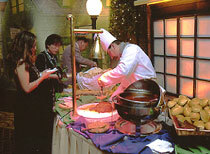 With our client-centered approach, we team up with our customers to help them execute an event. ANY EVENT has the flexibility to adjust to individual working styles, whether high-level, detail-oriented or hand-holding. Our experience and confidence allow the flexibility to work in a way that best suits our clients. Whether the venue is a vacant office space or a tent in a parking lot, we have the special expertise to manage an on-site event. Working with fire codes, internal groups and external services, we've seen it all. Whether your goal is to save money, increase productivity, build strong attendance or change the dynamics of your workplace; we can transform your venue into something special. We are experts at making your event, be it an on-site health fair, business meeting, holiday party, teambuilding event or celebration, high-impact, motivational and fun. We have the know-how to bring an event together. Working with a strong team of experienced professionals, we are able to obtain the best selection of services for your specific needs. The result; a polished event that reflects well on you and your company. something our employees look forward to. I've enjoyed the rapport we've developed with ANY EVENT over the years. They're professional, detailed, and a pleasure to work with. I've seen them hold their own under incredible pressurethey really know how to put on a show.